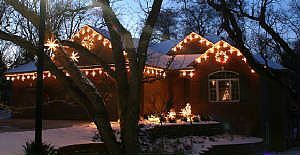 Enhance your home this season with a professional holiday lighting display by Tall Trees. With a full line of environmentally friendly LED's and numerous innovative displays, we offer the complete solution to your holiday lighting needs. By partnering with Brite Ideas Decorating, we are able to offer a high quality product that is both unique and customizable to your individual taste and home. We carry innovative products! We provide our customers with durable, cutting-edge lighting displays, greenery, custom designs as well as a variety of other products. Give us a call to schedule your free in home design consultation. We look forward to meeting with you with ideas about how we can take your holiday lighting display to the next level this holiday season!